So last time we talked a little about basic chains. And this time we need to talk about how the links are made and cut, and what we call the chain patterns. The process for making plain round links is a simple one. 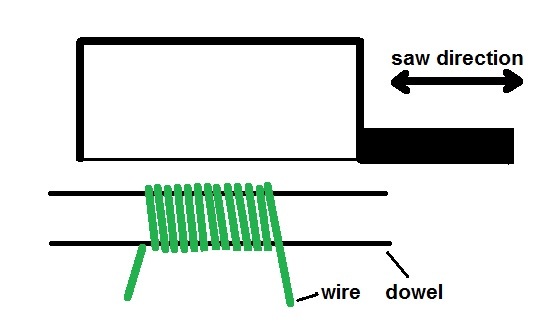 Just take a wooden dowel that is the size of the inside of the links that you want to make and wrap the wire that you plan to use around the dowel. This diagram shows the basic process. The wire in the diagram is not packed as tightly as I would normally wind it, so that you can see the separate winds. Your goal is to lay the wire completely up against the previous piece of wire as you wind it. This will give you a nice tight coil with uniform proto-links. I call them proto-links right now because they haven’t grown up to be links yet. Each wrap of the wire will become a link. You will need a jewelers saw to cut the links properly. A jeweler’s saw basically looks like a coping saw, but it has blades with very fine teeth that will make a clean, smooth cut on your wire. I always buy my saw blades in packs of 1 dozen, because you will break blades, especially when you are learning to cut links. And now a trick or two. Before you try to cut the coil of wire into links, wrap it with masking tape or painters’ tape. It helps to keep the coil from wobbling around as much and it helps keep the links from stretching as they are cut off of the coil. It also dramatically reduces the number of saw blades that you are likely to break. When you are ready to saw the links, just slide the coil to the end of the dowel and cut away. Don’t worry if the saw blade cuts into the end of the dowel a little. If your saw blade gets too sticky from the tape, just use some fingernail polish remover to clean off the tape glue. So now that we have links, we need to learn how to use them. The simplest form of chain is a one in one pattern. That simply means that one link hooks into one link. Like the top example in this picture. 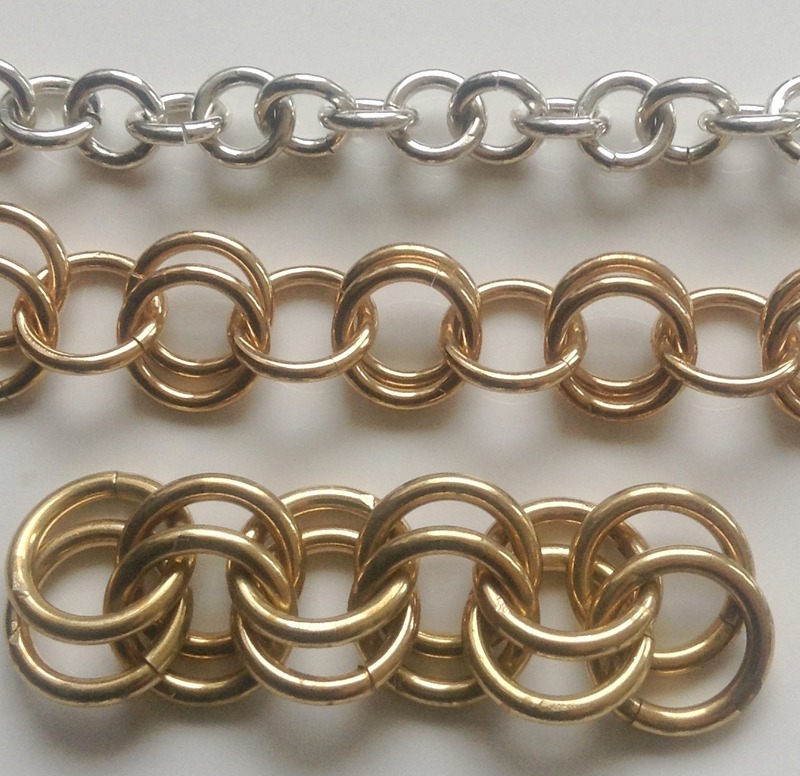 I just threw together three examples, they need some fine tuning before they are ready to go out into the world, but the picture shows 1 in 1, 2 in 1, and 2 in 2 pattern chains. These types of chains are all very common in pre-1600 crafts. When I first went looking for good pictures of pre-1600 chains a lot of the pictures were so poor that you really couldn’t see much, but then I ran across several pieces of chains in a book called the Ancient Hungarians, which was published by the Hungarian National Museum, and suddenly I seemed to find good quality pictures of chains everywhere. Next time we will talk about shaped chain links. This entry was posted in Jewelry, Metal Working and tagged chains, making chains, making link chains, medieval chains, Viking chains by Eirny. Bookmark the permalink.